Super Falcons of Nigeria have won the 2018 African Women Cup of Nations after beating the Banyana Banyana of South Africa. Goalkeeper Tochukwu Oluehi’s heroics on Saturday in Accra helped the Super Falcons of Nigeria to victory at the 11 African Women Cup of Nations (AWCON) in Ghana. It was however a very disappointing evening for the Banyana Banyana of South Africa who hoped for a first title but lost 3-4 to Nigeria on penalty kicks. At the Accra Sports Stadium, both sides had to endure 120 minutes of play before a winner could emerge. It was the first time in the tournament’s history that the final match was decided via penalties after extra time. 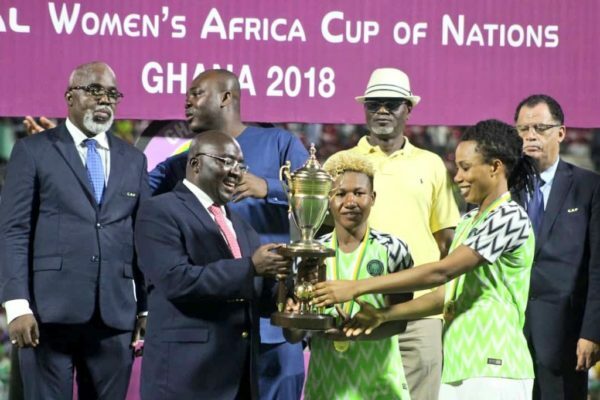 Nigeria, however had an opportunity to claim the title in the 75th minute after Francisca Ordega, who was later named Woman of the Match was fouled in the penalty area. Asisat Oshoala stepped forward to take the penalty kick, but she slipped and could not utilise the opportunity given, thus allowing the game to extend to extra time. However, the very resilient Banyana Banyana hoped and did a lot for a win, but they always found confident Oluehi an obstacle. In the end, Rita Chikwelu, Ngozi Ebere, Chinwendu Ihezuo and Chinaza Uchendu all contributed to Nigeria’s victory through their successful penalty kicks, after Onome Ebi’s miss. Alice Matlou, Nompumelelo Nyandeni and Mamello Makhabane scored for South Africa, while Lebohang Ramalepe and Linda Motlhalo missed their kicks. The News Agency of Nigeria (NAN) reports that Thembi Kgatlana of South Africa won the competition’s highest goal scorer with five goals to her credit.